Germany are bidding to win the FIFA World Cup for a record-equalling fifth time this summer, and become the first nation to win back-to-back crowns since Brazil in 1962. One player who will be looking to make a splash for Die Mannschaft is right-back Joshua Kimmich. Long tipped as a natural successor to the legendary Philipp Lahm, the 23-year-old is determined to tread his own path as he looks to help Joachim Löw's side get past Mexico, Sweden and South Korea in Group F.
Like many of Germany's most talented players, Kimmich came through the highly rated VfB Stuttgart youth academy, before joining the up-and-coming RB Leipzig in summer 2013. His performances for the Saxony club soon caught the eye of record Bundesliga champions Bayern Munich, who brought him on board in 2015. Kimmich made his Germany debut at the end of May 2016 and was a surprise inclusion in Löw's squad for UEFA Euro 2016. He went on to play every minute of the tournament from the third group game onwards, and has been a fixture in the national side ever since. He was named Germany's 2017 Player of the Year for his oustanding performances. Kimmich demonstrated his versatility in his first season with the Bavarian giants, being deployed as a defensive midfielder, centre-back and right-back by Pep Guardiola – who famously gave him a dressing-down after a draw with Borussia Dortmund in May 2016, only to shower his young charge with praise in the post-game press conference. Watch: All of Kimmich's Bundesliga goals and assists! Kimmich also featured regularly under Carlo Ancelotti in 2016/17 – scoring nine goals in all competitions – but it was upon Lahm's retirement at the end of that season that he became a genuine starter. He was Ancelotti and Jupp Heynckes' first-choice right-back throughout the campaign, making 47 appearances in all competitions. As well as winning his third Meisterschale, Kimmich was named the Bundesliga's right-back of the season with an eye-watering 82 per cent of the vote, and was also included in the UEFA squad of the season. What was his role in qualifying? 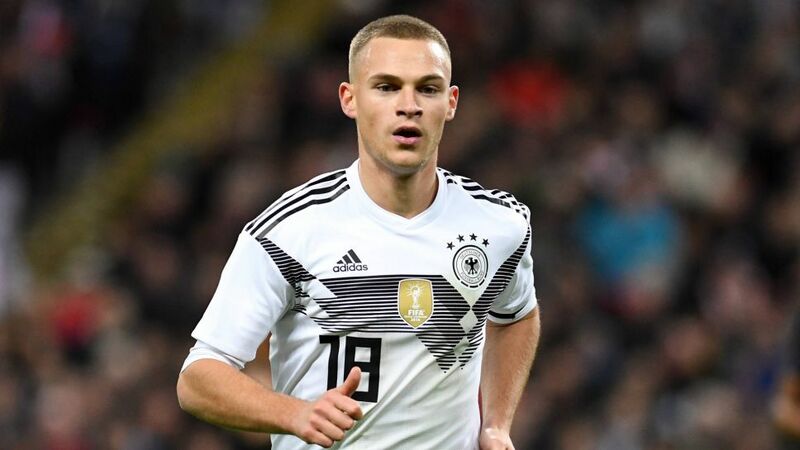 Kimmich played every single minute of Germany's flawless campaign, providing an impressive nine assists – two more than any other player in European qualifying. He also scored goals against Norway and Northern Ireland and helped Löw's side keep six clean sheets. The very definition of a modern wing-back, Kimmich will be a vital cog in the Germany machine at both ends of the pitch. His pinpoint crossing ability made him a formidable attacking outlet for Bayern this term – he had 10 assists in the Bundesliga, plus another three in the UEFA Champions League – and he also showed he isn't afraid of the big occasion, with goals in both legs of the semi-final defeat to Real Madrid. Defensively, his positional discipline has come on leaps and bounds under the likes of Guardiola, Löw and Heynckes, meaning he is unlikely to get caught out down the right flank. All you need to know about Germany at the World Cup!